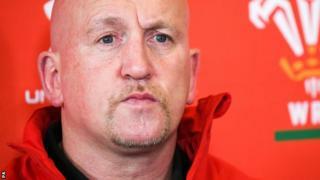 As part of the coaching staff, Shaun Edwards helped Wales to a Six Nations Grand Slam earlier this yearShaun Edwards will not become head coach of Wigan Warriors as planned at the end of the Super League season.Edwards, 52, was presented to the media in August 2018 when he talked of "testing himself" in league, having coached exclusively in union.However, after a successful Six Nations campaign as part of Warren Gatland's Wales coaching team, Edwards is expected to remain on the staff. "I will not be taking up the head coaching role at Wigan," Edwards said. [/i]"The reason is my lack of preparation. World Cup preparations have been brought forward a month and, as a result, I will be unable to spend eight weeks in Australia as planned on rugby league. "I feel Wigan need a more experienced rugby league head coach than myself, to give the club and the people of Wigan the best team possible. "The first signs that Edwards would not return to his boyhood club surfaced earlier this year when he confirmed there was not a written contract in place for him to join Wigan - only a verbal agreement.Edwards, who played in all eight of Wigan's consecutive Challenge Cup wins and featured in every game of every round between 1988 and 1995, was part of Wigan's late 1980s and early 1990s dynasty in which he lifted every available honour.However, his last involvement in rugby league came with London Broncos in 2000, and that inexperience in his old code has prompted the U-turn.Warriors chairman Ian Lenagan added: "He clearly feels that he is not the best man to take the team forward currently and I have to respect and accept this. "Like every Wiganer, I wanted Shaun to lead the team and this very honest admission has taken me by surprise. I have always admired Shaun and I wish him well with whatever he does next." "I'd like to thank our supporters for their patience and understanding in what has proven to be a very difficult situation to navigate and now we can concentrate on building more strong foundations to drive this wonderful club forward. We will announce our plans in due course. "More to follow.